Best Appliance Repair Service in Denver Metro! We repair all models and brands of refrigerators. When your refrigerator experiences problems such as not cooling enough, leaking, refrigerator runs noisy or any other issues, let us take care of it. We will help you! Call us now at 303-923-5851 or 720-881-1544 or send us Request for Service. If the condenser coils are underneath the refrigerator, clean the coils with a vacuum cleaner thoroughly at least twice a year. Refrigerator coils located underneath the refrigerator should be cleaned annually. Refrigerators that constantly run can indicate improper functioning due to low refrigerant level, a dirty condenser coil, a malfunctioning seal, or improper air flow. If the door is sticking or not closing properly... Wipe off the face of the gasket with a wet rag and make sure the interior shelves, drawers and food are not preventing the door from closing from the inside. At one time, refrigerators were the most costly appliance, using the most energy. 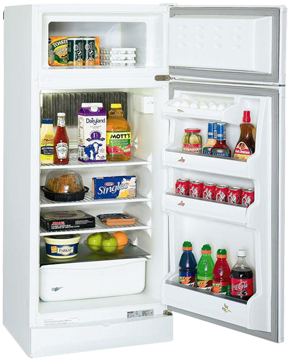 However, newer model refrigerators are much more energy efficient, costing less to operate. Refrigerators with top freezer boxes are more energy-efficient than those with freezer boxes on the bottom. Refrigerators with freezer boxes on the top or bottom are more energy-efficient than side-freezer models. Refrigerator/freezers with through-the-door ice dispensers are less energy-efficient than those without. Try not to leave the door of your refrigerator open. The longer it is open, the more cold air escapes, forcing the refrigerator to cool down the interior temperature more often. Typically, refrigerators keep their interiors at 41 °F. Many have different compartments with different temperatures, 50 °F for vegetables and 32 °F for meats. To better preserve your food and prevent spoiling, make use of your refrigerators different compartments, storing foods in appropriate areas.